← Undulating Perspective II: Blurry? i am a bit of depressive myself. danced the fine line in my youth, you mentioned, struggled through panic attacks. now, i have more supports, a loving hubby, kids, wonderful friends and so i feel more stable in my footing. thanks or bringing light to mental health! mama lola recently posted..quick halloween ghost project! Thank you for your comment, mama lola. Anxiety is something that is, I think, barely starting to be recognized properly. Now that people understand for sure that depression is a THING, it’s time people knew that panic attacks are also a thing, and not just in people’s heads. I’m glad you mentioned it, and also that you feel more stable now – there’s hope out there for people with anxiety. HUGS. My mom was my saving grace as well. I had worked in a place that nearly sucked the life out of me. Literally. My mental health issues, (depression, PTSD, Anxiety) started in 2005, and in 2006 my mom was ready and willing to postpone an African Safari trip she had planned with my Grandmother, and dragged me almost by the hand 3 days before the vacation, and sat me in my doctors office and made me wait for an emergency appointment. There had been days when I called her and told her to come and get her grand-kids, to take them and keep them, because I didn’t want to be a mom anymore. I didn’t want to face the world. There were days, weeks, and months, I wouldn’t even do my own grocery shopping, or leave my house. My mom has saved my life. A few times. I have had several regressions in the last few years, and had to go back on medication. But I give full credit to my mom. For standing by my side, no matter what I was going through, or what I put her through. And trust me, I put her through A LOT!!…. For taking endless hours out of her life, to talk me down and out of anxiety attacks, panic attacks and severe depression. For coming to my rescue and driving here to do whatever I needed her for on 5 minutes notice. I credit my mom, because she never gave up on me. She always believed in me…. and still does. Thanks Mom…. For everything… Ever… You are my hero, my saviour, and the reason I am still here today. T.S., thank you for sharing this. Honestly, you are one of the bravest people I know (and so is your mom). And while it can be frustrating to go back on medication after being off it, it’s not a failure. No one would think you were weak for taking vitamins when you had a cold or aspirin when you had a headache. It’s the smartest thing you can do, to find out what helps you feel well, and do that. Thank you again. Great post. I and many of my loved ones have struggled and had various levels of “success” with overcoming depression and anxiety. I think that success is hard to define and many people will never permanently overcome them. If you’re predisposed, it will be a lifelong journey of ups and downs. In my experience meds can often help pull someone through a dark time. Sometimes they are vital for correcting a chemical imbalance, and there should be no shame in taking them. On the flipside, they are dangerously over-prescribed in the US to people who are grieving or going through a tough life event and do not actually have an imbalance. Or to people who might be able to get through it by changing their lifestyles and getting therapy, and maybe haven’t tried to help themselves before resorting to meds. I believe talk therapy, being open with and leaning on loved ones, and good old-fashioned TIME (moving forward no matter what, even if they are TINY steps), sometimes in combination with meds, can get most of us through the really tough times. My wise mom once told me that when you feel like you can’t get up or go on, just change one thing. One tiny thing. It’s excellent advice because getting out of that slump is the hardest part when you’re in a dark place and the simplest action usually leads to other tiny actions. Extreme self-reflection, talking, and writing endlessly helped get me through my dark times. It’s so important to talk about this! To educate those who don’t know what depression feels like and to show others that we aren’t alone. Q, you’re right. It’s hard to think of, but mental illness is a buddy for life. So to speak. I think “success” in this context is any step up the ladder, no matter what step you were on before. I love that advice from your mom about changing just one thing – I think we all need that advice when life gets crazy and feels like too much. Good points about the medication, especially as it relates to grief… it can be such a tricky thing. I do wish more people had good opportunities for talk therapy – it seems like many people underestimate it, but as you point out, thinking/talking/writing/GETTING IT OUT is key. Those are the things that have gotten me through my own dark times that had nothing to do with my body chemicals. 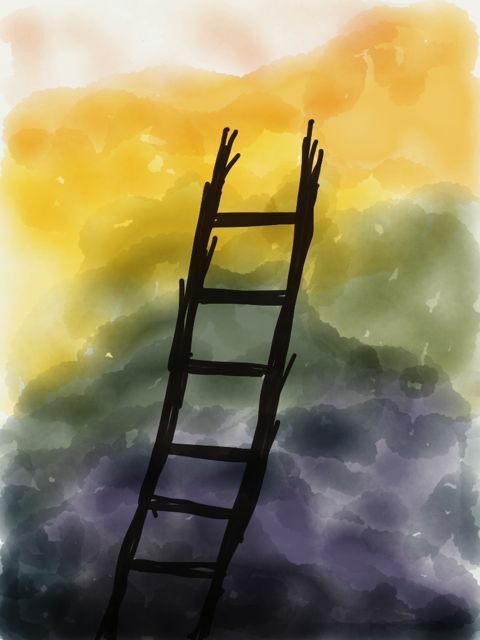 Something I read in a class in college, that I’ve never been able to find again, talked about a deep well that many of us fall into (it goes so nicely with the ladders metaphor), and how we can fall into that well, and get back out, and fall in again later. I, too, have a lot of depression in my family, and I’ve been in the well, but like Q, I did a lot of self-reflection, talking, and writing, and was able to get out. And as years have gone by, I’ve started to recognize signs earlier and earlier so I can stop the downward spiral before it really gets started. I’ve also noticed that one of the things that really helps me is a schedule. My worst days were when I wasn’t in class and wasn’t working, and was just stuck by myself trying to write a dissertation, with all the time in the world, but somehow never found time or motivation to get dressed that day, much less get writing. There have been times where I have had to write out a daily schedule for myself, with strict times, that included things like getting dressed, to help get myself back on the path to normal functioning (but it works!). But in the last eight and a half years, the thing that has kept my baseline happier than I had been for as long as I could remember before that, and helped keep me away from the well, was love. My wonderful husband has actually made a statistically significant difference in my mental health–he’s never seen me at my worst, because I’ve never fallen that far since I’ve known him, because he’s always caught me on my way down, and helped me back up. And today’s his birthday, so extra smiles and hugs his way for everything he has done for me! Helen, thank you for this, especially the advice about having a schedule – so practical, so simple, but can make such a difference. I think it might help those with anxiety as well. I know that on days when I’m feeling overwhelmed or listless (HA – I never made this word connection before) I need to make lists and organize my day – and I need to put the little, seemingly inconsequential things on the list so I know I’m accomplishing things. And I’m so, so happy that you and your husband have found each other. I wish all people could find their awesome, quirky someones to lift their baselines. HAPPY BIRTHDAY to that delightful guy you married! Great post, and great comments. I was just talking to a friend last night who has struggled for a long time with a lot of interlinked health problems and mental problems which are somewhat linked and somewhat separate. The big trick here is that both can influence each other, and sometimes you really have no control at all, but you still have to go ahead and do your best. We were talking about how sometimes you can feel really hopeful, like everything’s going to be okay, even when the cards are stacked against you and things are not easy. And then sometimes things are going pretty well but all you can see are the dark places, the traps, the downward spiral. Our outlook can have a huge impact on the way we deal with the most basic of tasks and goals, but we may not be able to choose our outlook rationally; there are so many processes that feed into it, and the brain can trick us, and so often does. Having practical support and help from loving friends and family who have the advantage of NOT living in our brain can make all the difference. So true. It seems overwhelmingly tough to have both physical and mental health issues in conjunction – but then, it can sometimes be a relief when one is causing another (like with Sean’s sleep apnea). There is still such a stigma to having mental health issues….even after all the increase in media awareness…most people still aren’t standing up and publicly saying that they struggle with this issue. I have volunteered with a community organization called COPE Mental Health which is part of Community Care Durham in my region. One of the groups that I co-facilitated was for people with depression. I was always amazed at the complexity of their issues but that they were so determined to come out and share their struggles and strategies in a support group. Sometimes I felt like who am I to “help” these people, but they were the ones who were helping each other just by talking about it. It was very powerful…and sad….when one group member said that this was the only place that he felt truly accepted. Many people struggle with these issues and all deserve respect and the support that is needed. Beverley, it sounds like you helped a lot of people, by being there to facilitate them helping each other. Bravo. I also know people who have benefited greatly from support groups. Feeling understood – and not alone – cannot be underestimated in the healing process.